You know what they say: April showers bring May flowers! Growing up, May Day was one of our happiest days of spring. We loved surprising our neighbors, teachers and friends with little bouquets of fresh flowers. It was a giddy treat to be able to sneak up to doors, hang our little baskets, ring the doorbell and run as fast as we could. Below is a super simple craft to make with your littles to share in a little May Day fun! 1. Create the decorative cone: Roll up a piece of decorative paper and staple in place. 2. Cut and trim the flowers to an appropriate length. 3. For longer-lasting flowers: Re--use the plastic wrapping (or a plastic bag) to create a waterproof cone to house a temporay water source for the flowers. 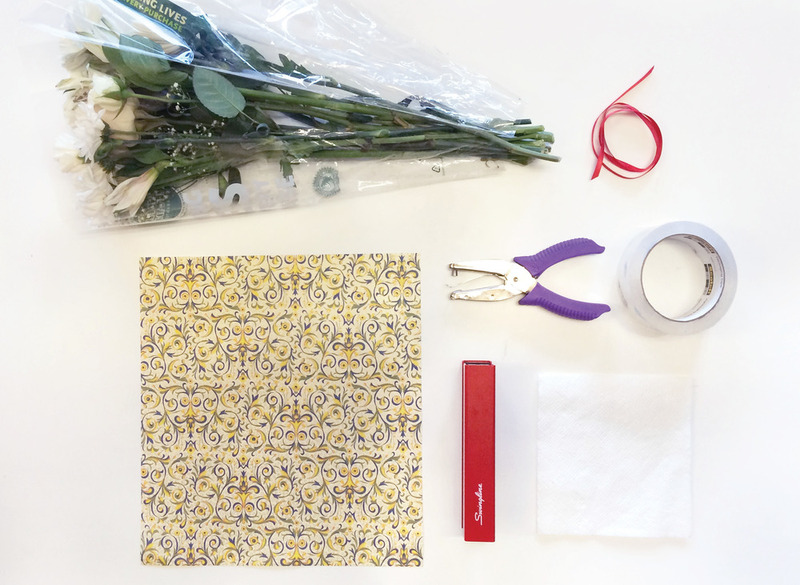 To do this, wet a paper towel and wrap it around the ends of your flowers. 4. Final assembly: Place the bundle of flowers in the plastic cone, then place into the decorative cone. Use a hole punch to create one hole on each side of the decorative cone. Cut two pieces of ribbon and tie through each of the holes, then tie the ends of ribbon together. front door (or office door like we did here! ).